Thanks for having me here today to talk about the release of my new story The Coach. I’m excited about this as The Coach is the most traditionally romantic of all the stories I've written. My previous books like Closer by Morning and Silent Voices have all contained thriller elements with the characters placed in perilous situations. But The Coach is straight romance. There are no murders, no violence, no scheming or backstabbing – just two beautiful men falling in love. Quite a departure for me and I loved it. It's not all sunshine and flowers. The story is set in the north of England during a bleak winter. We get a lot of those where I live, even as I write this my fingers are quite numb over the keyboard, but the cold gives us a good excuse to cuddle up with a hot man. Cole Jansen, the coach himself, is exactly that; a big, hirsute, hot-blooded guy. I loved creating this character and falling in love with him just like Josh Holleran does in the story. Cole coaches a local rugby team and lives in a small cottage high in the icy hills with just two cats for company. That's exactly how he likes it until he meets Josh, a reporter from the local newspaper, assigned to cover the teams winning streak. 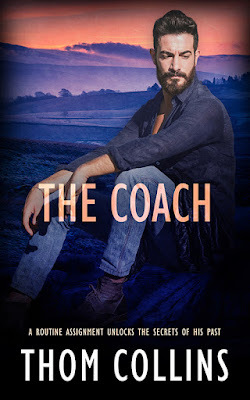 The Coach originally featured in the anthology Right Here Right Now from Pride Publishing, and I'm delighted it's getting a stand-alone release now. 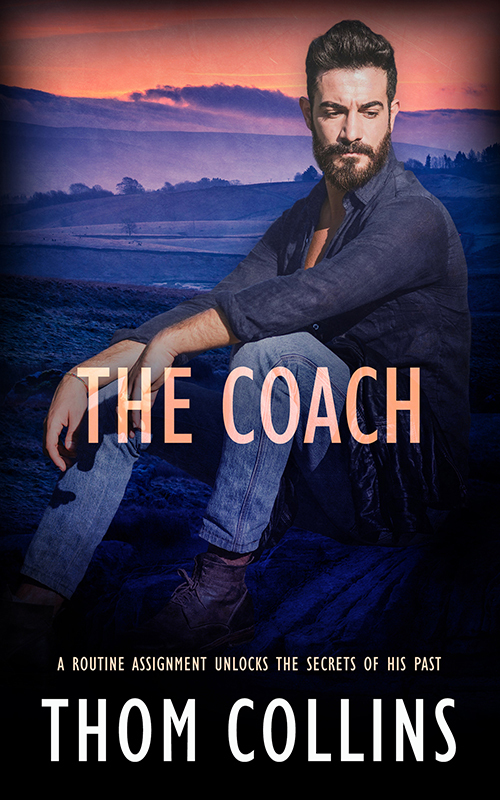 The new cover art by Posh Gosh perfectly captures Cole in a moment of quiet reflection. With winter coming in fast for many of us, The Coach is a great quick read for a cold, frosty evening. Make a hot drink, grab a blanket and snuggle up warm with Cole and Josh. Thom Collins first MM novel Closer by Morning was released by Pride Publishing in 2016. His love of page turning thrillers began at an early age when his mother caught him reading the latest Jackie Collins book and promptly confiscated it, sparking a life-long love of raunchy novels. The novellas Gods of Vengeance and Silent Voices were published by Pride in early 2017, followed by the novel Anthem of the Sea, the first book in the Anthem Trilogy in. He recently finished the second book in a series and is currently working on the third. I haven't read any of Thom books thaey sounds really good I'm adding them to my wish list. Looks like a great read. Congrats on the new book!